This coming Sunday Maris and I, along with our friends Ann, Evan, Liz and Tim are having a gallery opening at out local coffee shop, Bloc 11. The show has actually been up since mid-November, but we didn't have the time to do an 'opening' for the show until now. There we will have prints, stuffed animals, sculpture and original art on display, as well as additional prints and t-shirts for sale at the opening. Maris and I will also be bringing cupcakes. 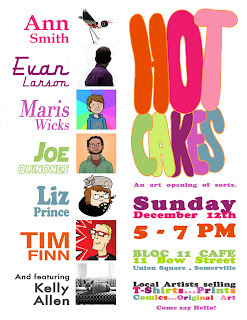 Come on by, local Boston folk! p.s. Should you not be able to make the opening, it's okay, seriously. Please stop worrying about it. The show will be up until early January, so you've got some time. Shouldn't you bring hotcakes instead of cupcakes...? Our cupcakes will be way more delicious. Boston is sadly terriby far for me to get too. Raincheck? I'll just need to come out to the UK sometime. This is awesome! I hope your opening was a blast! And now is when I discover your blog. A fellow artist from the Boston area. Well, I missed the opening. I might pass one of these days then, to see the gallery.